For over 90 years, the University of Houston has evolved to suit the needs of its students and its city. UH grew from humble beginnings – a junior college housed in an HISD school that became a full-fledged university educating the children of blue collar Houston – into today’s Tier One University. But just 14 years after its founding, UH had to make its biggest evolution of all. Before Pearl Harbor, the school was a small collection of buildings with an enrollment of just under 2500. 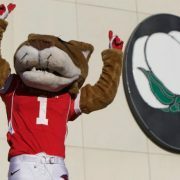 But that December 7th changed the course of the world, and with it, the University of Houston. The campus would lose a majority of its students to the war effort and had to scrap to find ways to forge ahead. “As we shift with the nation to a war footing, we will seek new assignments as part of the overall defense effort; but we will not forget either our antecedents, or the long future. All University of Houston curricula are designed to be vital and significant, and to be presented in relation to the world in which the student must live. We began, and we will continue, as a service institution, undergoing continuous growth and expansion to provide whatever courses are needed. In the 76 years since, the University of Houston has never wavered from that principle. UH’s new College of Medicine is the latest proof that UH continues to serve the individual’s and the community’s needs. As part of the agreement with the Navy, UH contracted to build an all-weather facility for drills, physical education, and meals. The Navy also required a place to instruct 10,000 trainees in war production courses. Dr. Walter Kemmerer, then a University VP (and UH’s future president), saw an ingenious way to help both the Navy and the University. In January 1942, UH began building the Recreation Building to service the Navy’s needs during the war and the University’s beyond it. 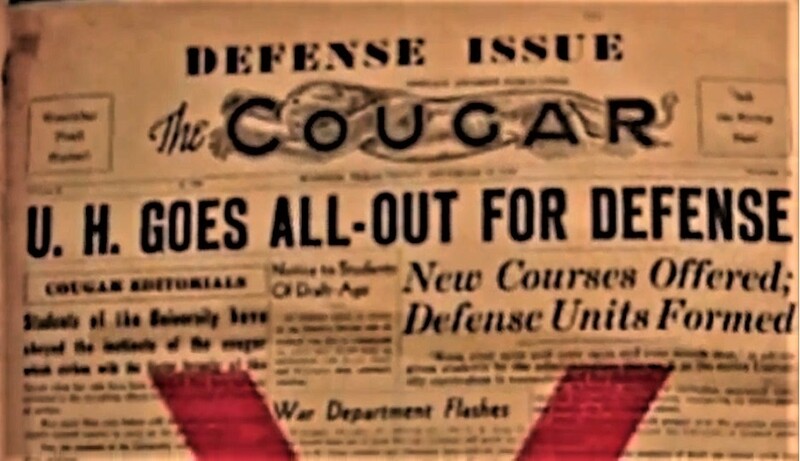 The Cougar was published monthly in the 1940s. This was the defense issue. Working 24 hours a day, construction crews finished the rec building in just 60 days. 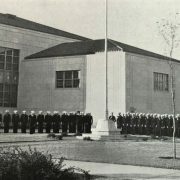 The Navy first occupied the building on March 12, 1942, and began training recruits through the U.S. Navy Reserve Vocational School. The Vocational School helped prepare sailors for their new jobs in fighting a two-front war. That same month, the highly-selective training activity known as the Primary School in the Electronics Training Program (ETP) began at UH. In its time, the ETP was the most difficult training ever given to enlisted servicemen – the program compressed two years of electrical engineering study into 3 months. Six locations were chosen for the ETP but only four were major universities: Oklahoma A&M College (now Oklahoma State University), the Agricultural & Mechanical College of Texas (Texas A&M), Utah State College of Agriculture (Utah State) and the University of Houston. The ETP compressed two years of electrical engineering topics into 3 months. With a fleet of 2,000 vessels, and more coming online each month, the Navy had outfitted just 79 with radar sets at the onset of WWII. It was up to the six ETP schools to train an elite group of gifted men in the newest of war technologies. Thanks to Dr. Kemmerer’s work, UH was involved from the beginning. The University of Houston’s participation in the EPT program proved to be just the sort of “vital and significant” curricula Dr. Oberholtzer had desired during the war. I went through 6 years of Houstonian yearbooks and dozens of articles and publications in search of photos for this story. I hope you enjoy this gallery of UH in WW2 photos and life at UH 1940’s. 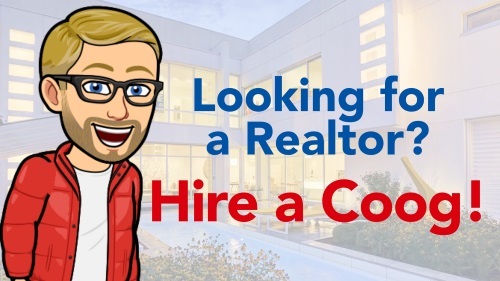 Click through the slides to get more information on each. Everyone can access the stories that say FREE in the headline. 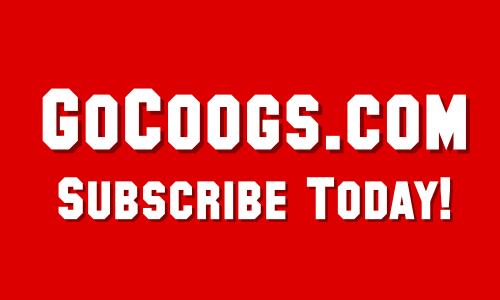 We make those available to demonstrate the value of a GoCoogs Insider subscription. But most of our data-driven articles are subscriber-only content.